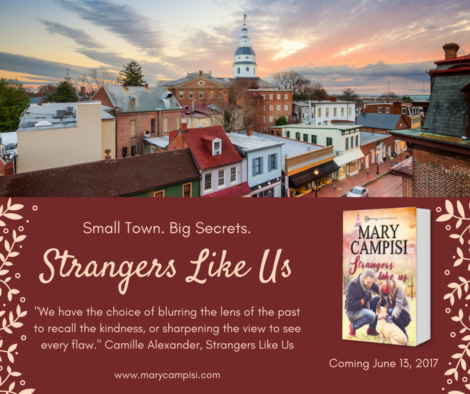 On June 13, 2017, I invite you to the small town of Reunion Gap, Pennsylvania for Strangers Like Us, Book One of my Reunion Gap series. If you enjoyed my “A Family Affair” books, these have the same feel, set in a small town surrounded by secrets. Yes, there’s heartache, betrayal, forgiveness, redemption, and second chances. But…this small town doesn’t open its arms to strangers and wayward drifters. Why? Because years ago, many of the residents were swindled out of their life savings by the smooth-talking stranger they trusted. So, what happens when a beautiful woman arrives in Reunion Gap, bent on helping the town and those in need? Well, a person can only fight the laws of attraction so long…and good deeds should not go unnoticed, should they? Will forgiveness and redemption follow? I love writing about hope and second chances in small towns where the residents have known their share of heartache. I grew up in a small town in northwestern Pennsylvania, so it feels very natural for me to write about a place where everybody knows everybody and a handshake is your word. But the best part is creating bonds that hold people together, friendships that endure, and of course, happily-ever-after—with a few bumps along the way! I do hope you join me as I begin this journey to a new town with interesting people, and big secrets! A man in a cowboy hat with a Texas twang doesn’t walk into a small town like Reunion Gap and ask for a cup of coffee without getting noticed. Same thing had happened when he’d moseyed into Magdalena, but back then he’d been pretending to be someone other than who he was—an investigator on the hunt for answers. This time around, he wasn’t hiding behind another persona, not that he was going to straight-out admit what he was doing in Reunion Gap, but at least the town would know who he was and what he did for a living. Investigators tended to make people edgy, and when a person got edgy, sometimes they revealed information they didn’t even know they were revealing. That’s all for now! See you in Reunion Gap.